Lettuce Greens Mix (Spring Greens [Tango, Baby Green Leaf, Baby Red Leaf, Baby Green Romaine, Baby Green Oak, Baby Red Oak, Green Chard, Frisee, Lolla Rosa, Red Swiss Chard, Baby Red Chard, Baby Red Romaine, Mizuna, Red Mustard], Romaine Lettuce), Mozzarella Cheese (Cultured Pasteurized Milk, Microbial Rennet, Salt, Distilled Vinegar, Milk Fat), Grape Tomatoes, Pitted Kalamata Olives, (Kalamata Olives, Water, Salt, Red Wine Vinegar [Contains Sulfites], Extra Virgin Olive Oil and/or Sunflower Oil), Green Onions, Pine Nuts, Black Pepper. Balsamic Vinegar (Wine Vinegar, Caramel Color, Contains Sulfites), Expeller Pressed Canola Oil, Olive Oil, Dijon Mustard (Distilled Vinegar, Water, Mustard Seed, White Wine, Citric Acid, Turmeric, Spices), Basil, Water, Sugar, Salt, Black Pepper, Xanthan Gum, Cayenne Pepper. CAUTION: Olives May Contain Pits. We’ve said it before that salad is an important part of our day. And thanks to the robust selection of pre-made salads at Trader Joe’s, you don’t need to shortchange your health or taste buds just because you’re short on time. That said, while there are plenty of hits, there are also a few misses. This Mozzarella & Tomato Salad with Balsamic Vinaigrette Dressing sits somewhere in between. On the plus side, there’s a wide variety of leafy greens, and the spinach is a good addition in terms of flavor and nutrition. 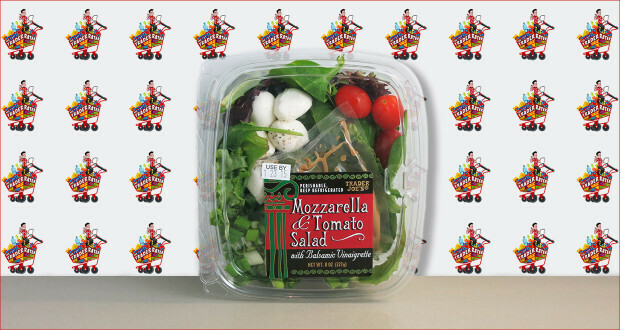 The dressing is also sharp and flavorful, and it serves as a good compliment to the mozzarella and tomato. On the negative side, the addition of green onions is a bit of a mystery – they really put a strong punctuation on the salad (not in a good way). While they are arguably tasty, the flavor really lingers longer than it should, making this salad a poor choice for school, work or any social gathering really. Also, if we’re being picky, the mozz could have used a touch more salt to dial up the flavor. All in all, we enjoyed this salad, but we don’t rate it as highly as some of the other options we’ve tried. 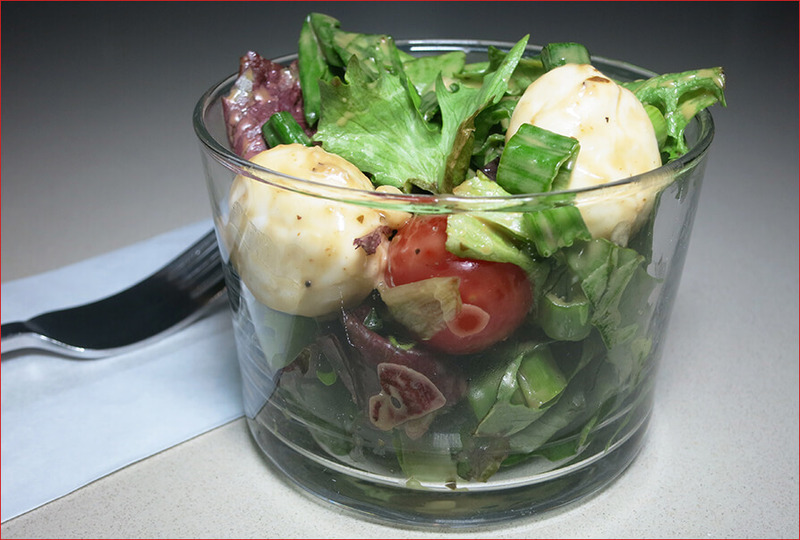 Summary : This salad scored high marks for it's plentiful variety of greens, but lost points because of the odd addition of pungent green onions.